Dwelling in the past is a non-productive and useless pastime. It means the here-and-now continues to pass you by. So we are certainly not advocating that you let the now slip through your fingers. However, to diminish the importance of the formative years is to deny many a solution that they have been unable to find anywhere else. A world that does not understand what a lack of attachment and trauma can do to the young mind is a world that is overly consumed with itself. A society is always best judged by how it meets the needs of its most vulnerable. And children unquestionably qualify for this. Their undeveloped brains make them easy targets for an often insensitive, critical and uncaring world. Read on and see if you can better understand the need to find creative ways of helping the most vulnerable – which might well include you.There are many factors which can impact on a child’s ability to form healthy attachments (relationships). What we know is that the infant’s own experience and interpretation of trauma in the first years of life, including the pregnancy period, can affect his/her development, and his/her ability to form healthy relationships. Trauma during the formative years can lead to damage, which fundamentally affects a child’s ability to grow, learn and develop in healthy ways. (See the valuable work of John Bowlby). A one-off trauma to an individual with well-established attachments and a reasonably mature brain and nervous system may be overcome relatively easily. However, risks increase if several severe, adverse conditions occur, or if the individual is still immature or otherwise particularly vulnerable. Such children are often described as ‘children who hurt’. Bear in mind that the earlier the trauma, the greater is the potential for damage – despite the commonly held belief that an infant lacks a mature memory system and will therefore not ‘remember’ or be affected by frightening or painful experiences. (See Why Love Matters by Sue Gerhardt). Early trauma can lead to a child experiencing major difficulties in forming healthy attachment and developmental connections (see Mapping the Mind by Rita Carter). Described below are some of the behaviours of children who hurt, which can result from early traumatic experiences. The most common characteristics of disturbed attachments are now relatively well recognised. Less familiar may be an understanding of the effect of dissociative processes on a child’s expectations, thinking and behaviour. Interruptions to the laying down of healthy connections in the developing brain and nervous system may mean a child doesn’t make the ‘right’ associations. For example, if the infant’s caregiver does not respond to her hungry cries on a regular basis, she may never associate the feelings in her empty belly with the comfort of warm milk and a tender cuddle. The links between the nerve cells in her growing brain and nervous system will not be used enough to establish the ‘right’ connections. Her sensations of hunger can remain dissociated from her consciously knowing what she is feeling and taking the ‘right’ action – eating may not seem the ‘obvious solution’ to the child. The young child’s most fundamental and effective defence against overwhelming distress is to separate off the unbearable experiences from normal consciousness. This has been described as ‘gating off’, which is where the parts of the brain responsible for logical function and emotional responses stop communicating with each other, to protect the ‘organism of the self’. As a result of these memories often not being stored together, the emotions, body sensations, thoughts and behavioural responses, which accompanied the traumatic experience are therefore not ‘joined up’ (integrated). This is why it is often difficult for the child to make sense of such experiences and for a sustainable solution to be found. 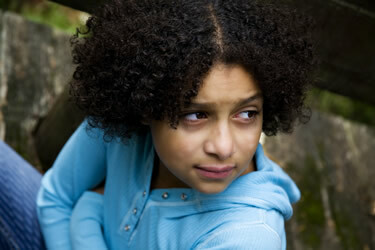 A traumatised child is seldom a ‘joined-up’ character, free of complexity. Behaviours you may see in the home will almost certainly alter dramatically in situations outside the immediately family. It is also common for parents of ‘children who hurt’ to report confusing or changeable patterns of behaviour within the home. For example, your child may be very rejecting of you at one moment and then show great neediness for you moments later. This lack of consistency and connection in your child’s thoughts, feelings and behaviours is common and understandable in terms of their ‘traumatic inheritance’ – when their world really was unpredictable and their lives disconnected. This is why working with children who have been damaged in this way takes time, consistency and requires a multi-factorial response (see: Story of Health). For the child to be ‘reborn’ he/she needs to experience a love and care that can first calm and then dissolve the ferocity of the traumatic storm he/she has experienced. Patience, consistency and unwavering faith and love will heal children who hurt.